﻿ Waterbury, Jean Parker. signed typewritten letter to Zora Neale Hurston,, New York. (1p. 8 1/2 x 11). Burroughs letter a shock. Waterbury, Jean Parker. signed typewritten letter to Zora Neale Hurston,, New York. (1p. 8 1/2 x 11). 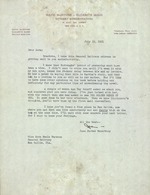 Burroughs letter a shock. NEIW YORK 12, N. Y.
getting mail to you satisfactorily. my own eyes, hence the 24-hour delay between his and my letters. definitely for any particular line of strengthening the novel. thoughts, ;you'11 have them by the first mail thereafter. for I want to know your feelings.